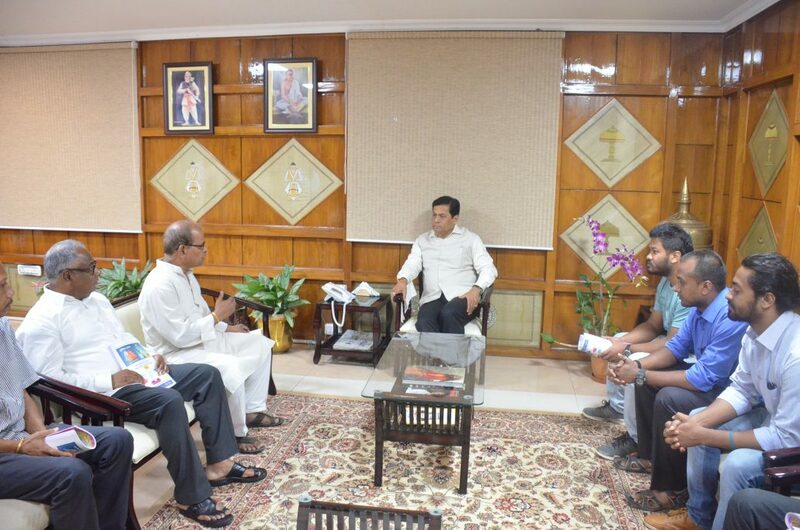 Chief Minister Sarbananda Sonowal during a meeting with the fathers of Nilotpal Das and Abhijeet Nath, the victims of mob lynching incident at Dokmoka at his office in Janata Bhawan on June 19, 2018. The fathers of mob lynching victims at Panjuri Kachari Gaon under Dokmoka Police Station in Karbi Anglong – Abhjieet Nath and Nilotpal Das – on Tuesday met Assam Chief Minister Sarbananda Sonowal at his office in Janata Bhawan and sought constitution of a Special Investigation Team (SIT) to expeditiously probe the incident. During the meeting, Abhjieet Nath’s father Ajit Kumar Nath and Nilotpal Das’s father Gopal Chandra Das made a written submission to the CM with their suggestions and opinions for awarding maximum punishment to the culprits involved in the incident. The CM assured that all measures have been taken so that the culprits receive maximum punishment accorded for the crime and no loopholes would be left in the investigation for the perpetrators to escape as the SIT under a DSP has already been constituted for the case. Because of the swift action of Assam Police almost all the accused are nabbed in a short period of time and subsequently, the Chief Justice of Gauhati High Court would be requested to put the trial in a fast track court for speedy justice delivery, Sonowal said. The CM stated that he is personally monitoring the progress of the case as the crime has tarnished the image of the state and he has also directed the police for consulting an expert criminal lawyer while preparing the charge-sheet of the case so that technical loopholes do not remain through which the criminals can escape. The fathers of the two slain youths requested that a competent and experienced police officer of higher rank must be in-charge of the SIT and they said that in 21st century such barbaric incidents due to superstitions must not be allowed to take place. Saying that that it is the Government’s duty is to ensure that justice is not denied and exemplary punishment is meted out to the culprits, Sonowal said that the state’s guest friendly image has taken a beating in view of the incident and government is committed to take all measures to redeem that image. Legal and media advisers to the Chief Minister Shantanu Bharali and Hrishikesh Goswami, Chief Secretary TY Das, Principal Secretary of Home LS Changson were also present during the meeting.